The Freedom Maze by Delia Sherman. Small Beer Press, 2011. Currently Available. Face Value: What I like about this cover is the way it captures the story – the line drawings manage to be evocative of both time periods of the book, the 1960s and the 1860s. It plays a little young – middle schoolers will probably be more likely to pick this up based on the cover than high schoolers will, but overall, I think it’s a lovely, effective piece of cover art. Does it Break the Slate? Oh my goodness YES. This is a slate-shattering book, on many levels, both explicit and more subtle. In The Freedom Maze, Sherman has given us a wonderfully empathetic Slatebreaking heroine in Sophie, and a meaningful perspective on race, gender and families in two different historical contexts that translate beautifully to contemporary readers. Who would we give it to? I think this should make its way into the middle school required reading list. It’s a compelling story, with meaningful historical and contemporary context about race, gender and humanity. But more specifically, I think this will appeal to both lovers of historical fiction and more fantastical time travel stories. Sophie is a reader, and she makes her reckless wishes inspired by Edward Eager’s time traveling children. Lovers of Eager’s work who are ready for something a little grittier will find a lot to love in this narrative. The book starts in the summer of 1960 when 13-year old Sophie is being sent away for the summer. After her parents’ divorce, her father is in New York with his new wife and her mother is going back to school to become a CPA – a secretary’s salary isn’t enough for a single parent. So Sophie is sent to stay with her grandmother and aunt for the summer, in the former plantation house that her family has owned for generations. Struggling with her mother’s expectations, her father’s absence and overall loneliness, Sophie is miserable. So when a strange creature appears, Sophie makes a wish for an adventure in the past. But when Sophie is transported back 100 years to 1860, she doesn’t find the glory days that her grandmother talks of – with her summer tan and messy hair she finds herself mistaken for a slave. There’s no romanticizing history here – Sherman paints a stark portrait of what slavery was like for the inhabitants of the Fairchild Plantation. 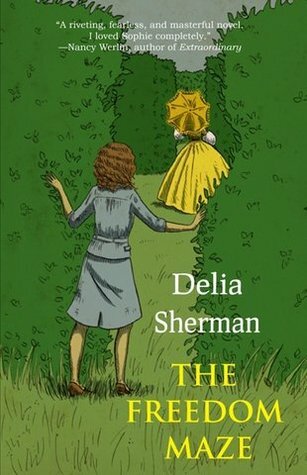 And, reminiscent of similarly powerful books like Octavia Butler’s Kindred and Zetta Elliot’s A Wish After Midnight, Sherman complicates the romantic idea of time travel itself. Unlike Sophie’s beloved Edward Eager books, there’s no Natterjack here to make sure that the children are dressed appropriately for their new time and to rescue them when things get difficult. Once Sophie has been labeled a slave, she realized, that is her permanent identity, and her life in 1860 is incredibly hard, first as a house slave, and then working in the sugarcane fields. When she finally returns to 1960, her months in the past reduced to a half hour gone in her own time, the proof has not vanished with her return. She’s aged – grown and developed in the ways that a thirteen year old grows and develops, and that can’t be hidden away. It also makes what happened to her a real, legitimate experience, not some magical learning opportunity that vanishes upon her return. It’s not just physically that Sophie has changed in her time in the past. She’s not the same girl she was before. And even though she spend months wishing to return home, she finds herself stunned by her reality once she returns. She has a whole new outlook on race, a new understanding of her own capabilities and a perspective on humanity that has irrevocably shifted. Sophie’s journey to empathy and a sense of racial equality is neither surface level or one of platitudes – she goes through a meaningful experience and it changes her point of view. No longer a passive observer, she is an active experiencer of oppression, racism and the deepest kinds of injustices. Don’t get me wrong – I love Edward Eager, just like Sophie does and, I would imagine, Delia Sherman as well. But for young people who loved those stories and are ready for a more complicated look at history and its repercussions, this is a perfect next step. By setting Sophie’s present in 1960 – a time when racism in the south was widely accepted – we have a whole new layer added to Sophie’s journey. Her mother is harshly racist – pulling Sophie out of public school with the threat of integration and warning her that black men were “lazy and dirty and dangerous.” Her grandmother longs for the “good old days.” In doing this, Sherman effectively makes her point about racial inequality in multiple historical contexts, and the parallels to today are vivid. Too often, these stories are reduced to surface value characters, stereotypically drawn heroes and villains. But Sherman’s characters are richly drawn, complicated characters who behave the way they do because of their circumstances and particular characters, not because of a typical or expected stereotype. The family that Sophie finds herself welcomed into, is particularly wonderful, from the prickly Antigua to the earnest Canny. Even the slaveowners are not presented as arbitrary villains. Instead – and must more dangerously – they are real humans who have embedded hateful values in their belief system. Alongside her powerful historical, racial commentary, Sherman still makes multiple significant points about gender. As awful as Sophie’s mother is, we still have empathy for how hard the world is for a divorced woman in 1960. And yet, despite her struggles, her expectations for Sophie still follow very traditional gender roles, and (at least in this narrative) she shows no sign of changing her ways. Sophie’s growth is not mirrored in her mother’s attitudes. But at the very least, we end the book feeling certain that Sophie herself is about to start standing up for herself. There’s so much more to this beautiful book than I can possibly capture in one review. But I implore you, add this to your to-read list immediately, and hand it off to everybody you know. It’s worth it. This entry was posted in Reviews, Young Adult and tagged Andre Norton Award, Civil Rights, Historical Fiction, Racism, Science Fiction, slavery, Time Travel, Young Adult. Bookmark the permalink.